January 24, 2011 - The Department of State has delivered three UH-60M Black Hawk helicopters to the Government of Mexico’s Federal Police (FP). Designed and manufactured by Sikorsky Aircraft Corp., a subsidiary of United Technologies Corp. the aircraft are the first of six advanced helicopters designed to support Mexico’s law enforcement operations as part of the Merida Initiative, a security cooperation agreement between the two countries. 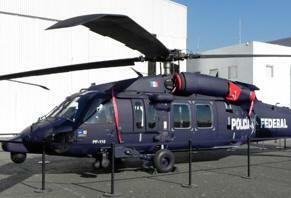 The three UH-60M aircraft expand the Federal Police force’s existing fleet of seven UH-60L Black Hawk helicopters. Operational since 2008, those aircraft have become a critical law enforcement tool for disaster relief, troop transport, rescue, surveillance, and in the fight against organized crime and illegal drug trafficking across Mexico. Introduced into service with the U.S. Army in 2006, the UH-60M is the latest and most advanced variant of Sikorsky’s successful H-60 Black Hawk helicopter series. The U.S. Army took delivery of its 200th ‘M’ model in mid 2010, which comes equipped with an advanced flight control system to reduce pilot workload, and an infrared camera for night operations. “Use of the forward looking IR sensor, and this Black Hawk helicopter’s superior lift range and speed will further enhance the capabilities of the Federal Police to perform their very important law enforcement mission,” said David L. Powell, Sikorsky Vice President of Sales for the Americas. At a Mexico City reception to recognize delivery of the UH-60M helicopters, Sergei Sikorsky, son of Igor Sikorsky, who designed the first viable helicopter in the 1930s, remarked that helicopter operations in Mexico had lived up to his father’s ardent desire that rotary wing aircraft be deployed for humanitarian purposes. In the summer of 1945, his father accompanied a 1945 scientific expedition to photograph the interior of Mexico’s erupting Parícutin volcano. The U.S. Army Air Corps and the Government of Mexico arranged for a Sikorsky R-6A helicopter to fly above the crater to help scientists observe the volcano’s interior during more than 100 flights at altitudes as high as 8,000 feet. It is believed the flights were the first ever by a helicopter in Mexico, and the first to conduct scientific observations of an active volcano. Then in early October 1955, helicopters were again deployed to Mexico, this time by the U.S. Marine Corps from aboard the light aircraft carrier USS Saipan. Their mission: to evacuate thousands of Yucatan residents stranded by flooding caused by Hurricane Janet.